Estee Lauder introduced the NEW Pure Color Envy Shine Sculpting Lipstick in Malaysia. If you have been reading overseas beauty blogs about Pure Color Envy Sculpting Lipstick, let me share with you that in Asia we have Pure Color Envy SHINE Sculpting Lipstick instead which is a range designed exclusively for Asia. And seems like our Asian colours are more sheer compared to the ones in US. 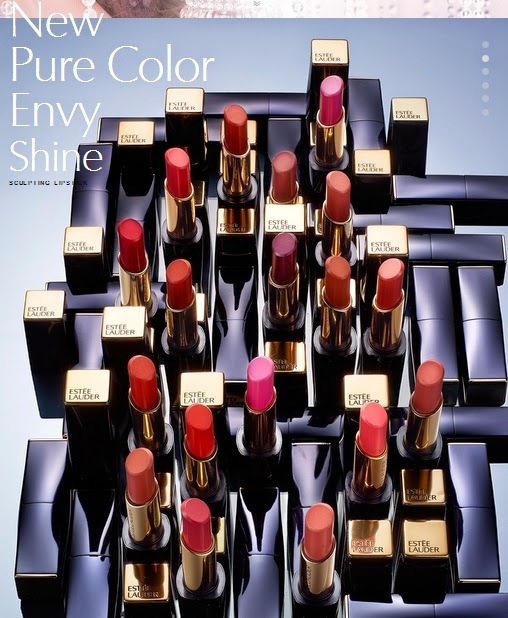 In Malaysia we have total of 16 shades under Estee Lauder Pure Color Envy Shine Sculpting Lipstick that is set to enchance and brighten the complexion of Asian women. A luminous shade range of nuanced hues with pops of bright tones include delicate nudes, captivating corals, demure pinks and heavenly berries. All create enviable lip-sculpting statements that range from a fresh look to a soft glamour look. My immediate pick is under the Corals to Reds shade because I have pinkish lips colour and I always feel coral lipstick looks great against my skin colour. 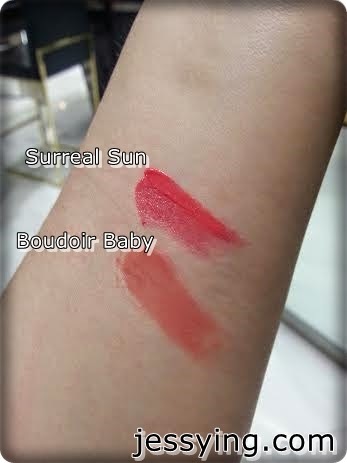 Initially I picked Surreal Sun but it was not available so I was settled with Boudoir Baby. And last week when I was in Bangkok and I managed to see this collection at the counter and get both of them swatch side by side. Surreal Sun looks coralish with a hint of pink while Boudoir Baby is coralish with a hint of brown. I think Surreal Sun colours is absolutely beautiful - got to check out this soon! Back to my review, the new Estee Lauder Pure Color Envy Shine Sculpting Lipstick's design is inspired by modern architecture, the new and iconic, slim-line package design is powerful, yet feminine. Its lines are contemporary, with a sleek and elegant silhouette. The color cues reflect Estée Lauder’s signature navy and gold, while golden plaques at each end of the case, and golden tones within the interior, convey the modern glamour and style of the brand. I love how the casing of Estee Lauder Pure Color Envy Shine Sculpting Lipstick which has the magnetic closure and it always clicks the case perfectly into place every time without fail. The new aspirational bullet shape make this ultrachic lipstick a statement in pure luxury. This Estee Lauder Pure Color Envy Shine Sculpting Lipstick promise Illuminate, Sculpt and Hydrate. This Asian exclusive lipstick does more than a lipstick as it gives moisture and shine, surrounds lips with effortless, luminous color, and adds dimension for a fuller, more sculpted pout. I do find this Estee Lauder Pure Color Envy Shine Sculpting Lipstick in Boudoir Baby looks more coral pinkish before I swactched. Here are 3 layers of swatch of Estee Lauder Pure Color Envy Shine Sculpting Lipstick in Boudoir Baby. I do find that with 1 layer it is a little bit too sheer but it's buildable and looks pretty after the 3rd layer. Even with just 1 layer I can see there there is a high-shine finishing. Also Estee Lauder has included Multi-Faceted Color Pigments that create shape, definition and volume. It looks coral with a hint of brown on my hand , I do realised it looks a little different from the picture above. I think maybe because the lipstick picture was taken indoor and the swatch was taken under natural sunlight. Well let me show you how it looks on my lips. I am glad to find that this Estee Lauder Pure Color Envy Shine Sculpting Lipstick has no scent at all! *jump around happily! * I still remembered the EL Signature Hydra Lustre Lipstick which I had .. has a sweet vanilla scent which I am not really a big fan of it all! Honestly the staying power is about few hours including a meal in between and for me that's good enough as long it keeps my lip moist. As I mentioned earlier on my lips colour are pretty pinkish and this Estee Lauder Pure Color Envy Shine Sculpting Lipstick in Boudoir Baby turns to complement it so well. Personally I think Estee Lauder Pure Color Envy Shine Sculpting Lipstick would sell pretty well because it fulfils what a women wants in a lipstick - the illuminating colour, shine, long lasting moisture plus the magnetic ultrachic lipstick packaging which gives the feel of pure luxury. 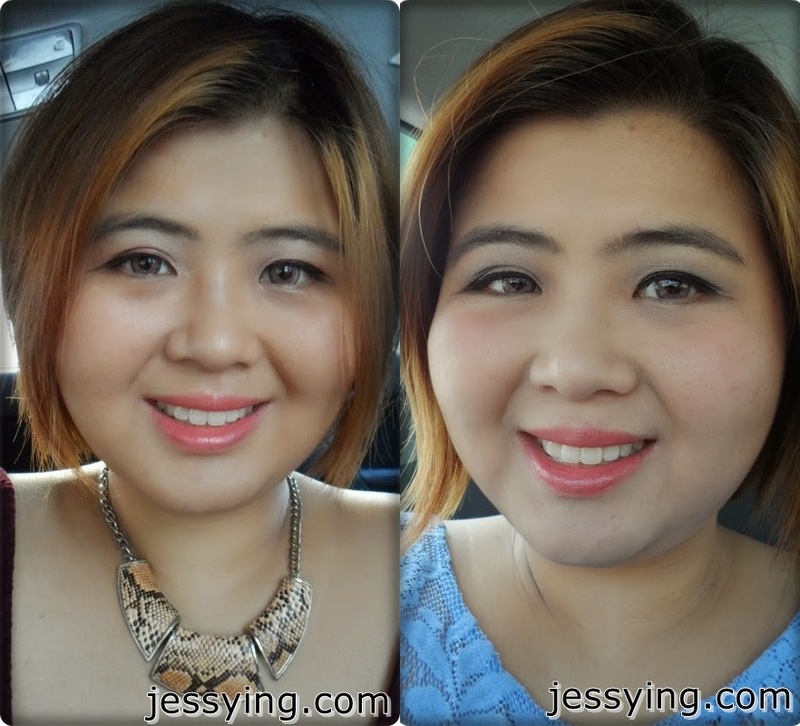 Now that I have tried the colour, I love the Estee Lauder Pure Color Envy Shine Sculpting Lipstick in Boudoir Baby colour as it will actually suits for all occasion and makeup. Estee Lauder Pure Color Envy Shine Sculpting Lipstick which is an Asian exclusive comes in 16 shades all together. It is already available at all Estee Lauder counters nationwide starting April 2014 for RM98.